Voted by Hostelworld customers 5th Best Hostel Worldwide January 2012, 8th Best Medium Hostel Worldwide 2011, 2nd Best Hostel in Spain October 2011, #1 Best Hostel in Spain August 2009, 6th Best Hostel Worldwide December 2009 and, as one of the hostels in the Sant Jordi Hostels Chain, 2nd Best Large Hostel Chain Worldwide 2011. Sant Jordi Alberg has an exciting, entertaining, fun and friendly atmosphere with no curfew. As part of the party hostels of Barcelona, Sant Jordi Alberg is the best place for young people who are travelling by themselves, want to meet new people and have memorable experiences. Here everything is designed to make sure you enjoy your stay in Barcelona to its fullest. Centrally located on Calle Roger de Lluria just up from Gran Via de les Corts Catalanes, our hostel is just 10 minutes walk from Passeig de Grcia, La Casa Batll, Plaza Catalunya, Las Ramblas and the famous barrio del Born and less than 15 minutes by metro from the beach. In our neighbourhood youll find some of the best markets, bars and restaurants in all of Barcelona. Our bedrooms vary in size with 3-, 6-, 8- and 10-bed mixed dorms. They all have good-sized bunk beds with the sheets, pillows, blankets and lockers included in the price. Laundry facilities and towels are also available for a minimal additional fee. We have a fully-equipped kitchen that you can use day or night, a large dining area, and a comfortable living room with a huge TV, movies, games and books. We also have four computers providing free 24 hr high-speed internet access and free Wi-Fi. Our young and friendly staff speak English and Spanish and will provide you with maps and all the information youll need or want - sightseeing, transportation, restaurants, nightlife and more. As were travellers like you, we know what you want out of a hostel and will do all we can to make you feel comfortable and make your stay in Barcelona unforgettable. Were the party hostel of Barcelona. With us youre guaranteed to have the time of your life. While Barcelona is famous for its bars, clubs and beautiful Mediterranean beaches, Sant Jordi Alberg is famous for showing you the best of Barcelona and giving you an experience youll never forget. Several nights a week we organize special outings to restaurants, bars and clubs. This is a free service we provide for your enjoyment. 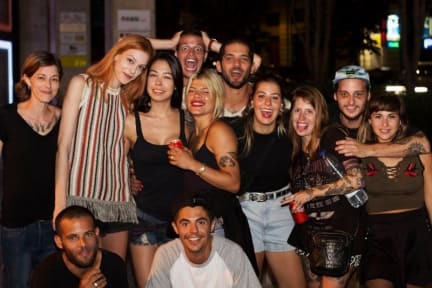 We are famous for our parties and this is the best way to experience the renowned night-life of Barcelona and get to know some of the other guests in the hostel. Were professionals and this is our job so come along and enjoy the fun! It was a perfect hostel.You can get to the hostel easily from the center of Barcelona. (from Aero bus station,train stations within 7 mins)Staffs were awesome,tourists were friendly as well.I highly recommend to stay here.Great atmosphere!! !Pedro I really appreciated to giving some medicines.Agustin,thank you for taking care of me.Daniel always told me the best way to somewhere. Renatto helped me at midnight.Rodrigues knows about art museums,Dali very well.The dinner Emy cooked was tasty!